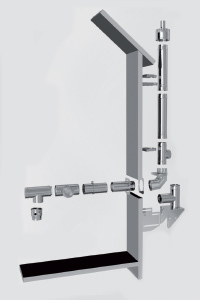 The LAM system consists of concentric rigid pipes, molded parts and accessories. Made of PPH/matt stainless steel. The LAM system is available in Ø60/100-200/300mm. Designated for chimney gas flue systems in outdoor areas. The components of the LAM system are connected by conical connectors. This system enables complete evacuation of gases and fumes resulting from condensing and low-temperature boilers with maximum flue gas temperature at the boiler of 120°C. It is primarily intended for use in overpressure mode, but can also be used in under pressure operation. It can also be used for natural draft chimneys. The system is not intended for flue gas lines where ash combustion can occur, it is not resistant to soot fire. It is intended for use in wet operating mode, and usable only for heating systems, where gaseous fuels such as natural gas (L, H) and liquid fuels (LTO with sulfur content ≤0.2% or kerosene) are burned.